Considering its relatively small population (23 million), Australia is a very well-known country, perhaps because it is English-speaking, perhaps because of the perceived exotic side, with kangaroos, koalas etc. Then again, it is the sixth largest country in the world by total area, which besides the Australian continent includes the island of Tasmania and many smaller islands. Most people live in the Eastern states. Officially the reigning monarch is Queen Elizabeth II of England. Because of its large size, Australia has different climates and landscapes, from rainforests to mountain ranges, though overall it is quite flat. Most of the country is semi-arid or desert. The Australian cuisine is not too well known outside of the country, aside of the fancy meringue dessert pavlova (which I did consider adapting, since nowadays there is such a thing as vegan meringue, but large meringue surfaces are still difficult). Another well-known thing is Vegemite, a yeasty sandwich spread similar to Marmite, said to be heavily an “acquired taste”. ANZAC biscuits I already made for New Zealand’s entry. The Australian aboriginal diet, called “bush tucker” was quite a bit simpler (though very nutritious), consisting of wild vegetables, fruit, berries, herbs and spices, macadamia nuts, fish and meats like emu, kangaroo and crocodile, often wrapped in Melaleuca tree bark and baked in ground ovens. Macadamias and kangaroo meat are still popular and recently bush tucker food has become a trend. Modern Australian cuisine is heavily influenced by e.g. British, German and some Asian cuisines. Australia produces quite a lot of wine. Corn fritters are a traditional (or at least a very popular modern) Australian dish. There are many different recipes on the net, but they almost always contain buttermilk, eggs, some mashed and some whole corn kernels as well as chives. 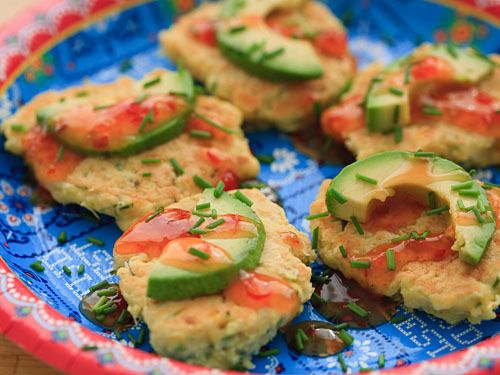 These vegan corn fritters are adapted from a recipe from Australian Broadcast Corporation. The vegan “buttermilk” trick is included in many vegan cookbooks. According to this page, you should be able to use a nut milk or hemp milk almost as well, but most non-dairy milks won’t curdle well, because they’re too low on protein. This was a tasty dish, in a bland, comfort-foodish way. Sure to please kids, as well. Despite the large amount of chives it is more like a slight accent than a distinct flavour. In the original they were served with “Chilli Jam, Crispy Bacon and Avocado Salsa”. I went for sweet chili sauce and avocado slices which was a very nice combination, but other sauces (from mayonnaise to ketchup and chutney), marinated onions, pickles, fresh tomatoes etc would probably work well, too. Just don’t serve them without any accompaniments. Pour the vinegar into the soy milk, stir and let stand for 10 minutes. It should curdle a bit and will probably look quite unappetizing and clumpy, but that is alright. Mix in the egg substitute. Mix the flour, baking powder, salt and pepper together. Make a well in the centre. Add all the other ingredients (except for the frying oil) to the flour mixture. Gently mix ingredients together until combined (don’t overmix). Heat a fry pan over medium heat with a tablespoon of oil. Add heaped tablespoonfuls of mixture to the pan in batches and flatten slightly. Frying 4-5 at once is fine. Cook for 3 minutes or until firm and golden brown at the bottom. Turn and cook for another 3 minutes. Serve hot with above discussed accompaniments. Makes about 20 fritters, enough for 4-5 people as a side dish, a part of breakfast or a snack/light lunch. Reheats well, especially on the frying pan, and should freeze well, too. This entry was written on August 18th, 2012 by Maija Haavisto and filed under Oceania, Side dishes.